Today's card features the new Digital Paper Pack Graciellie Desgn's just released called "Coffee Lovers." Wow! It has thirteen super gorgeous papers in it and was a ton of fun to create with!! What a fabulous creation Esther! Love the colors and that donut looks good enough to eat! LOL Thanks so much for joining in the fun at our Double D ‘Snuggle Up Buttercup’ challenge! Good Luck and we hope you’ll come back often. Oooh, I love this! The expertise and style you applied popped right out and grabbed my attention at Double D. Love the colors and the wood grain. Not the first time I've seen that Lumber embossing folder lately, and I think I NEED it! Thanks for sharing with us at Double D! i looooooooove this so much!! great design. fantastic colors. love the texture! Very pretty card. I love the colors and awesome paper and images. Esther! This is absolutely beautiful! I love what you've done with the new digital papers! Gorgeous!!! I love the combo of digital papers with your coffee cups! Esther, you never disappoint! This coffee inspired card is simply BEAUTIFUL! Merry Christmas! Oh Esther, what a delicious card! It's soooooo YUMMY! Love the natural looking panel and delightful treats! Your coffees look amazing and fattening lol Thanks so much for playing along with us at The Double D Blog, Snuggle Up Buttercup Challenge, Donna, DT Member. Such a beautiful card, Ester, with Graciellie's digital images. 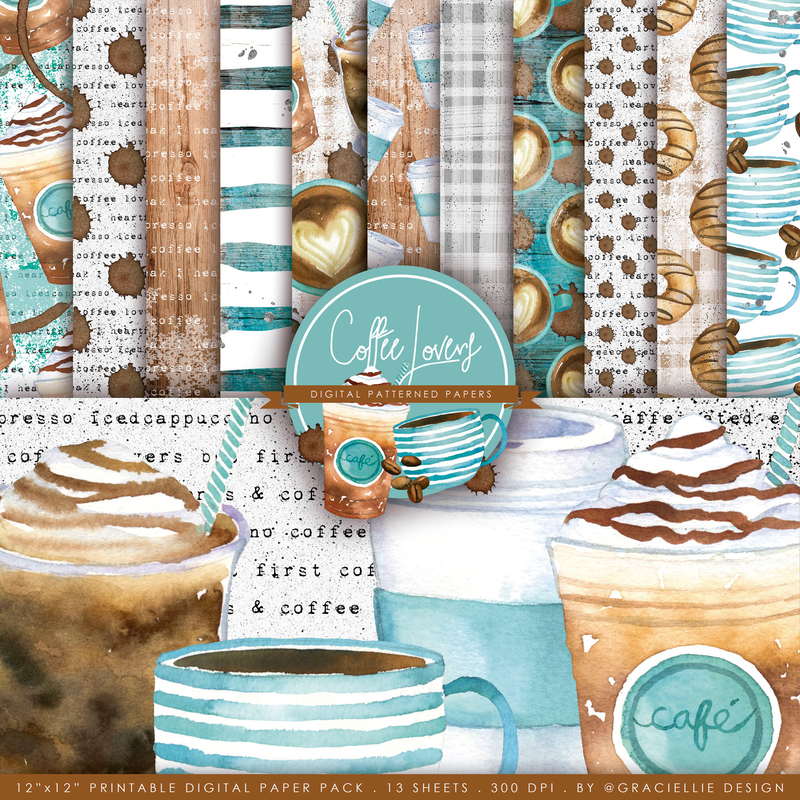 Wonderful array of yummy coffee treats on this card and I love the mix of pattern papers used too. Wow, Ester. This is one beautiful card. Love the gorgeous papers. Lovely layout. Oh my, beautiful and delicious. Gorgeous papers! SO beautiful!! Love those papers and love how fantastically you've used them! Always tons of inspiration when I visit you! what a fabulous card, love all the colors! Just love the blues and browns...so beautiful. Your card has so many interesting features Thanks for sharing. wow its so very pretty! Stunning card, Esther. I love the textures. These colors make me think of the ocean. You’re very artistic! Delightful color combo on this beautiful card!